One week to Christmas! Ex or no ex, I had to go shopping. 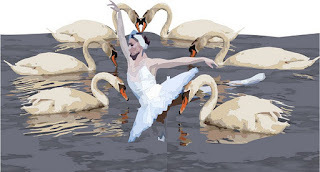 While I was out I heard the following report on the radio: "On the lighter side, dancers from local production of Swan Lake were invited to assist in a Twelve Days of Christmas montage. When it was revealed that they were to pose outside in icy water, they respectfully declined. Whew! My ornamental pond was full of half-submerged ballarina figurines and littered with feathers. I suspect he tried live swans first. This took a twist, not at all what I was expecting. Loved it. it's like my morning dose of serial mystery...a nice, little "cozy". Thanks. I'm so glad you're enjoying the tale. Can't wait to find out how you like the maids a milking.